As I reflect on my sewing career, I realize I have sewn miles on my machines. I usually try to avoid hand-sewing if it can be done by machine. I didn’t get my first machine until I was 29 years old. Prior to that I sewed everything by hand. When I was young I received many craft kits from my parents and relatives. One project that I enjoyed was a miniature teddy bear. I made that bear over and over again. As nieces and nephews appeared I would stitch up a bear for them. Eventually, I got a machine, and was able to expand my creations to larger dolls and stuffed animals. I ventured into clothing for my kids and accessories for the home. Now a new generation has arrived in the family and I found myself wanting to create a simple doll for my great-niece who is turning one. I found this simple, gingham doll on Martha Stewart. 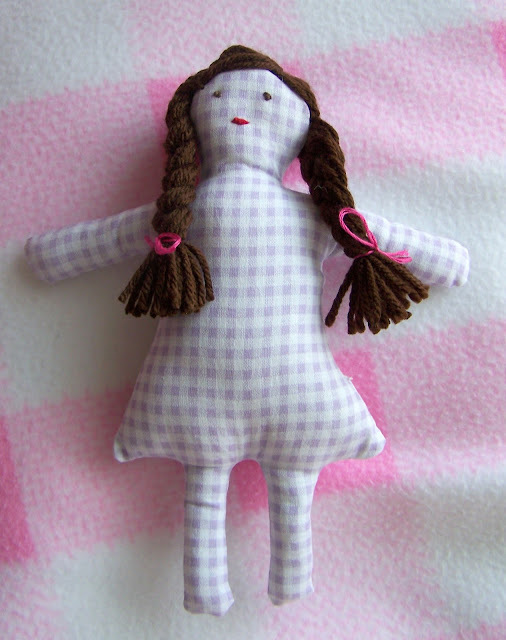 The instruction page includes templates for an entire family of dolls that are simple to make. With only two pieces, I stitched around the fabric using my sewing machine. But it could have easily been stitched by hand. I turned it inside out, stuffed the doll, and hand-sewed the opening closed. I added simple eyes and mouth and some yarn hair to complete the look. The simplicity of using my hands to create this doll was rewarding. she’s beautiful, I love her hair! The doll is adorable. Thanks for providing the link. She is very sweet! Your great-niece is a lucky girl. The hand sewn mini teddy bears sound adorable. Wish I could see one.